So I teamed up with Southern Recipe Small Batch to make sure everyone knows how awesome their pork rinds are. When they contacted me, I had actually just had my first-ever-in-life pork rind. No kidding. My family never bought them growing up, so I was just never around them that much… and I guess they never really appealed to me. Plus, as an adult, I’m just not a super big packaged snacker. But my husband brought home a bag of them the other day and I gave them a try. And… yeah. I loved them and totally see what the big deal is. Not only am I not a general fan of packaged snack foods, I’m also annoyingly allergic to corn and dairy, so there are limits to what I can have packaged snack wise. I also don’t have a sweet tooth, nor can my body tolerate too much sodium or preservatives and nitrates or it rebels and I resemble a cartoon blowfish. So, yeah. I have limited options and therefore am the girl who travels with her own food. And these here pork rinds being just meat won me over big. I became all in on the pork rind that day. Then, like that same week, I hear from Southern Recipe Small Batch, asking if we could work together and it was like the best day ever. I tried four of their flavors and two of them were BAKED. 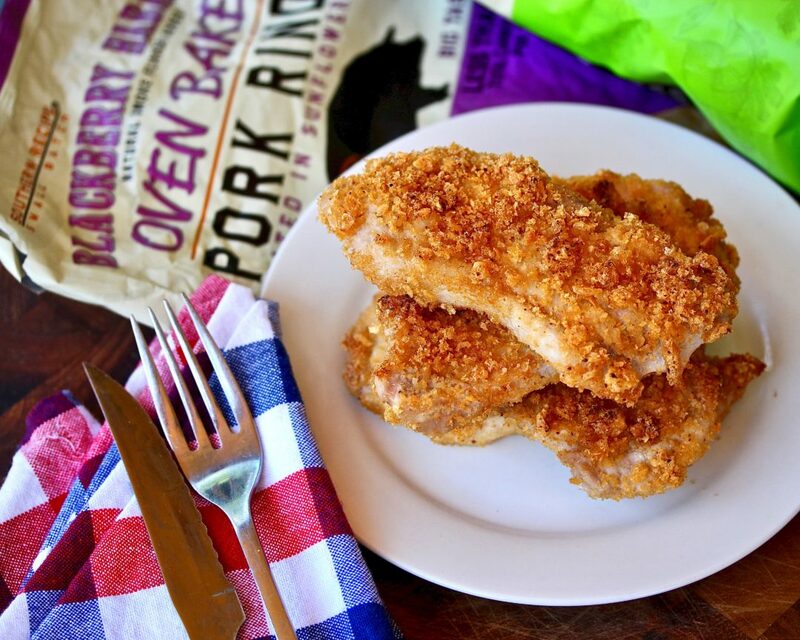 Baked Pork Rinds?! You know I’m not a big fried foods fan, so that made me super happy. They also are remarkably low in sodium compared to other pork rind brands, which is perfect for me. These are obviously delicious as snacks on their own… that’s what they’re made for – a snack. But, I wouldn’t be me if I didn’t spin things around and get weird. 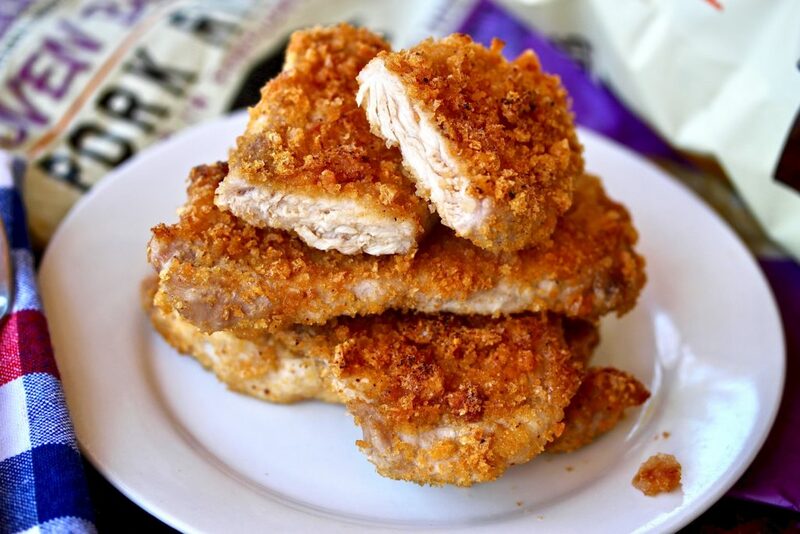 Enter in the idea of pork chops coated in crushed up pork rinds and roasted until crispy. 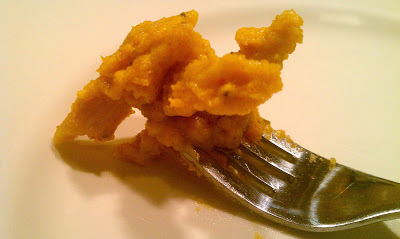 Like a fried cutlet, but way better for you and sooo much easier. I had some pork rinds left in the bottom of one of the bags and just decided to crush them up right in their bag using my hands, then dunked each pork chop inside the bag and coated it in the crumbs! No mess, no extra dishes, didn’t even get myself gooped up. And, ya’ll – it’s so easy. Like so easy I feel guilty for wasting your time. EXCEPT I’M NOT WASTING YOUR TIME BECAUSE YOU’RE GONNA LOVE THIS RECIPE AND ME MORE FOR GIVING IT TO YOU. If you’re someone who can’t or don’t want to have bread and such, this is a way for you to get that crispy and fried feel. It’s really super fantastic. And you can use any flavor of pork rind for a completely different flavored meal! I used the blackberry habanero, but it was a tough choice… I love that this flavor is slightly sweet with a good spicy kick on the end. It reminds me of barbecue sauce, but elevated. Any flavor will do, just depends on what you want your meal to taste like! The flavor of the rinds really comes through here. They sell these at Kroger, Harris Teeter, World Market, Meijer and… Amazon! 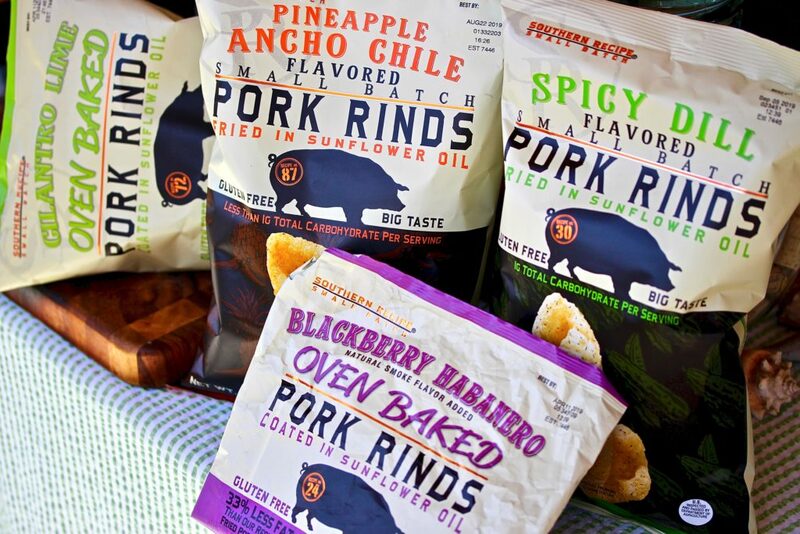 I highly suggest you pick up a bag or three and taste the difference between Southern Recipe Small Batch pork rinds and all the others… way better for you and super fun flavors. 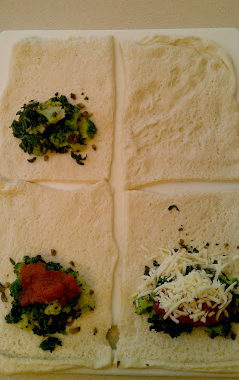 recipe makes 4 chops, but easily multiplied! Cover a baking pan with foil for easy-cleaning, and place a wire rack over the pan. For every 4 pork chops (I chose the thin cut, boneless, because I wanted a solid crust : meat ratio) you will need about 2 ounces of pork rinds, which would amount to about 3 ish cups, then once crushed, is roughly 1 cup. You can crush them however you’d like, even use the food processor, but I didn’t want to dirty up anything. So as I said before, I just kept them in the bag and smushed them with my hands from the outside of the bag. You want fine crumbs but a few little clumps are fine! And you can use a bowl or dish, or a zip bag… but again, I didn’t want to clean anything, so each chop went straight into the bag and I pressed as much of the crumbs onto each side of each chop. You really want the whole surface area covered with the crumbs. Place each coated chop on the prepared wire rack. Serve hot with whatever your heart desires. They are so juicy, so tender and so delicious. If they sit too long, they lose their crispness, so get on ’em fast! You can use this same technique on chicken thighs or chicken breast cutlets, veal, even a firm meaty white fish! These Southern Recipe Small Batch pork rinds and their porky crumbs are my new best friend.